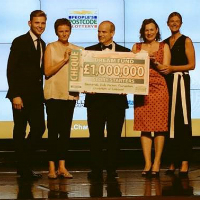 Professor Julian Pine (centre) receiving the £1 million cheque at the People’s Postcode Lottery’s annual Charity Gala. An innovative project to boost the language and communication development of nursery school children has been awarded £1 million in funding from players of People’s Postcode Lottery. The Story Starters project is a collaboration between researchers at the University of Liverpool, the national charity Beanstalk and Dolly Parton’s Imagination Library. The funding will result in the recruitment and training of 600 Story Starter volunteers to give one-to-one support, with high-quality literacy resources, to 1,800 disadvantaged children between 3 and 5 years old, creating an innovative approach to learning. A team of University of Liverpool researchers from the ESRC International Centre for Language and Communicative Development (LuCiD) will provide robust evidence-based support and evaluation to the project. Research shows that children who benefit from high-quality support in their early years start school on average around three months ahead in their literacy and language skills compared with children who attended low-quality settings. These benefits carry on throughout life, as they are 20% more likely to get 5 A*-C GCSE’s, and earn more as adults. LuCiD is a five year research collaboration working with partners from across the world to improve understanding of how children learn to communicate with language, and the Story Starters project is part of a wider strategy LuCiD has to promote better evaluation of early years language interventions. 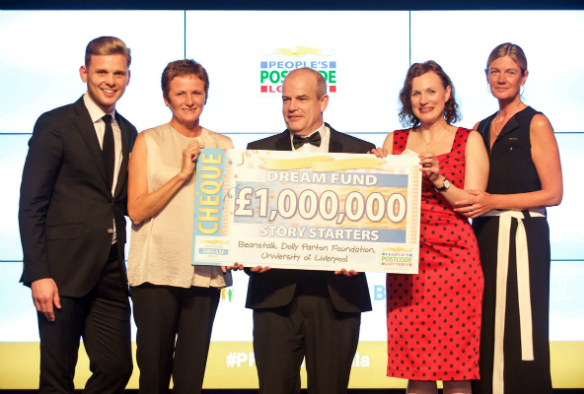 Liverpool researcher Professor Julian Pine, Deputy Director of LuCiD, said: “We are delighted that Story Starters was chosen as one of the winners of the People’s Postcode Lottery’s Dream Fund 2017. “Too often, we see interventions implemented in early years settings which have no evaluation at all. This can have far-reaching consequences with cash-strapped nurseries investing money in interventions that don’t actually work and children with delayed language making little or no progress. The LuCiD team includes over 40 researchers and 7 PhD students from the University of Liverpool, Lancaster University and the University of Manchester investigating key research questions about language development. They are supported by international partners in Europe, the US and Australia. The funding announcement was made on 24 January at People’s Postcode Lottery’s annual Charity Gala, held in Edinburgh’s Prestonfield House. The event was attended by HRH Prince Charles and BBC’s Planet Earth presenter Sir David Attenborough and was a celebration of the £66.3million awarded to charities in 2016 by the People’s Postcode Lottery.